On a lovely Sunday afternoon, a large group of happy people came to ALNR to create the Cathedral Copse. 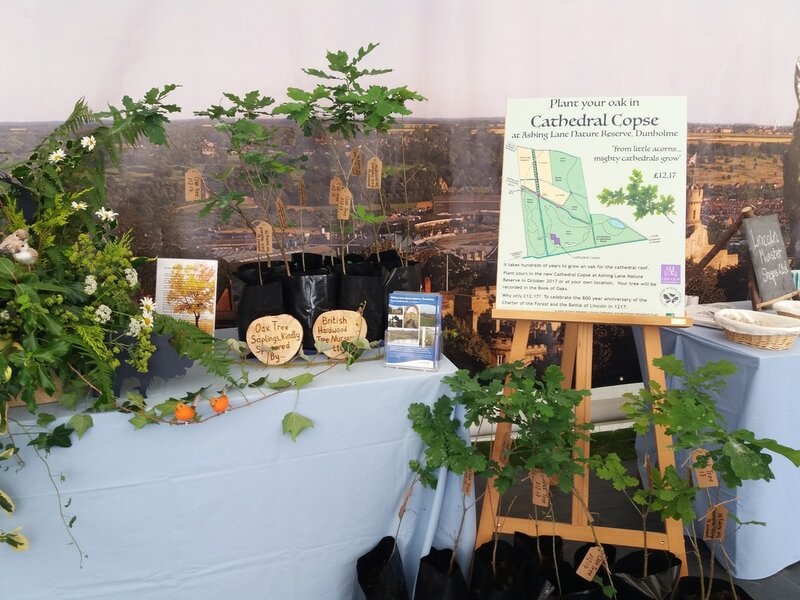 Between 12:00 and 14:00, 124 young oak trees that had been purchased at the Lincolnshire Show in the Lincoln Cathedral marquee were given their new home. At 13:00, the Dean of Lincoln Cathedral blessed the Copse and the new marker stone, to complete a most enjoyable community project. Thank you to Anita Holdich and her team from the Lincoln Cathedral Centre for initiating this future source of oak for the Cathedral roof. To see the list of the names of the people who dedicated each oak, please click on the icon next to the name of the map below. Names are listed alphabetically by last name. To see where the tree is and get the GPS location, click on the name and the corresponding tree will be identified on the map. Alternatively, click on an icon on the map and the name of the planter will be shown on the left. 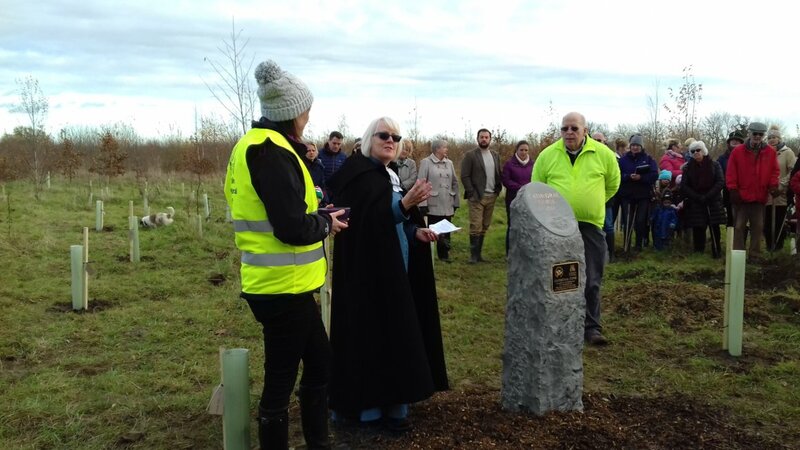 The wonderful new stone, produced by the cathedral stone masons, was delivered and installed today at the site of the new Cathedral Copse in Monks Wood, ALNR. Charles Pickering with his great tractor and Bob Stubbs, Stuart Jackson and Damian Krsyzanowski helped Rod swing the stone into position and plant it firmly in the ground. The brass plaque naming the Copse is already attached and the carving on the top will be completed soon. What a lovely marker for future generations who will see the oaks grow to maturity and hopefully be selected for use in Lincoln Cathedral. ​Look out for the temporary signs marking where the new Cathedral Copse will be planted in November. You will see them on the left hand ride edge as you walk south from Monks Oak and the Threshold in Monks Wood. Ultimately, the signs will be replaced by a stone marker in the edge of the wood, carved by the Cathedral masons. The Cathedral Copse will be home to 120 oaks, planted by the generous people who bought them at the Lincolnshire Show in June this year. In a new initiative with Lincoln Cathedral, NWT has designated a 0.211 hectare area of South Wood for the planting of oaks for eventual use in the Cathedral. Oak saplings (generously donated by British Hardwood Tree Nursery) will be available in the Cathedral marquee at the Lincolnshire Show 21-22 June. They are priced at £12.17 to celebrate the 800th anniversary of the Charter of the Forest and the Battle of Lincoln in 1217. There will be an opportunity to plant the oaks in November (pencilled in as 26 November) and we hope the new Dean will be able to come and bless the new Cathedral Copse as part of the event. ​Each oak purchased will be recorded in the Book of Oaks, held at the Cathedral as a record of the trees promised for future repairs. What is the Book of Oaks? Lincoln Cathedral needs a constant supply of oak timber for the ongoing restoration of the high roofs, several tons each year. In 1993, the Forestry Commission, for whom I was then working, developed a grant scheme to encourage the creation of New Native Woodlands and the management of old woodlands in the County. At the same time, Roger Parsons, Fund Raiser for the Cathedral, was seeking opportunities to secure a long-term supply of oak for the roof restoration. Thus, to raise awareness for both projects a publicity event was held aloft in the Cathedral towers looking across the fragmented woodlands of Sherwood Forest and the Lincolnshire Lime Woods. From this partnership between the Forestry Commission and the Cathedral Team, the Book of Oaks was born. The Book gives an opportunity for woodland owners, and individuals, within the County and beyond to dedicate oak trees for the ongoing and long-term restoration of the roofs. Each dedication is recorded in fine script within the leather-bound Book of Oaks which rests in the Cathedral. The Book remains open for new pledges. After retirement, I entered a new chapter of my forester life and am now a Trustee of Nettleham Woodland Trust. 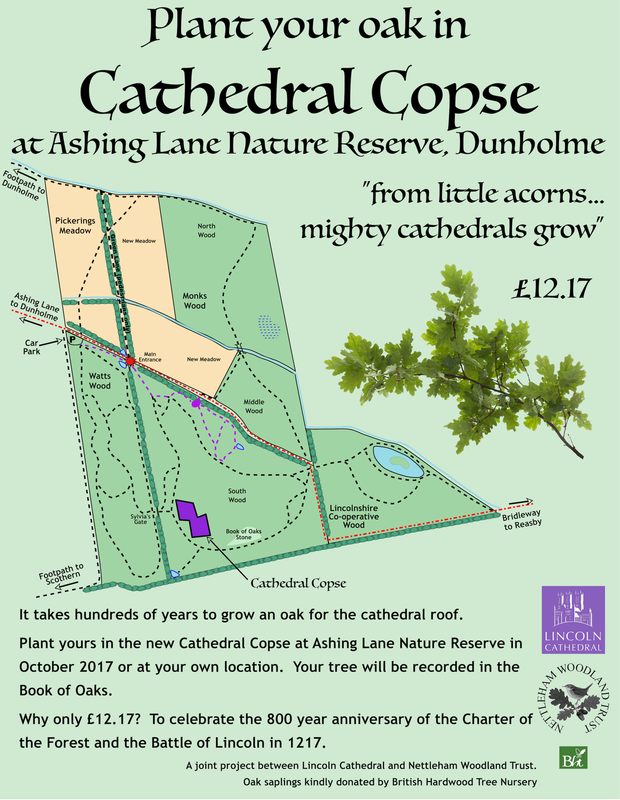 For the cause, the Trust has promised one hundred oak trees from Monks Wood, Ashing Lane Nature Reserve, Dunholme. The Book of Oaks Stone, two ton of carved Yorkshire sandstone sponsored by the Cathedral, can be found in Monks Wood, and is a permanent record of this promise. It was unveiled by Dean Philip Buckler on 7th November 2015. The first trees are likely to be selected for the Cathedral early in the twenty-second century. They will be felled, sawn and seasoned in the triforium.